So a couple of weeks ago it was Boyfriend's birthday, and rather than go out and buy a generic birthday cake, I thought I'd bake something with Seb. Seb loves to bake, and at five, he's getting increasingly useful to have in the kitchen, and less of a whirlwind (still not safe around icing sugar though!) 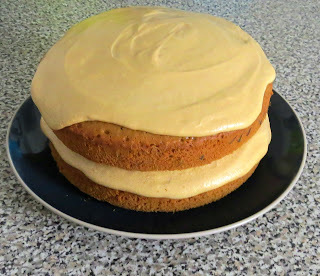 - so I decided to revisit one of my favourite recipes, and create an extra indulgent coffee sponge, with plenty of delectable, sickeningly sweet coffee buttercream. I used two 20cm sandwich tins to create the two sponges here. This gives a pretty tall cake if you're using the measurements below - but bigger is always better where cake it concerned I say! Preheat your oven to 160, grease the side of two sandwich tins and line them with grease proof paper. Using an electric food mixer, combine the 300g of butter with the 300g of caster sugar to create a creamy, rich yellow mixture. Crack the six eggs in to a separate bowl of jug, and whisk with a fork, then, with your electric food mixer on a low setting, gradually pour in the whisked eggs, mixing constantly. Add the flour and baking powder and fold in gently with a large wooden spoon or spatula. Gradually add the 3 tbsp of coffee, and continue gently folding, keeping lots of air in your fluffy mixture. Divide the mixture equally between the two tins and bake for 30 mins. Allow to cool completely before icing - even a slightly warm cake will melt the icing and create a real mess! To make the icing, combine the icing sugar, the 200g of unsalted butter, and the 3 tbsp of coffee with an electric food mixer in a very large bowl. Spread icing evenly over both sponges, and then carefully place one iced sponge on top of the other to create a sandwich. There should be enough icing left over for some gratuitous spoon licking!